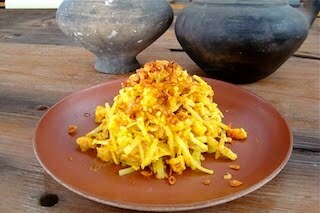 This is one of my favourite Balinese dishes, and also one of the recipes I made with Chef Stefan on my Balinese getaway.. It's such a flavorsome and original salad, and yet so simple to make.. Beautiful! If you do not have green papaya, then use cabbage instead.. You will need the Seafood Spice Paste, which I posted yesterday for this dish.. Prepare the dressing.. Heat oil in a pan, add the Seafood spice paste, sauté for a few minutes and add the prawns.. Cook just for a minute or so, then add the stock & coconut cream, bring it to a boil and simmer for another minute.. Season with salt and pepper, set aside and allow the dressing to cool..